Ramona Johnson, Pennsylvania Positive experience from start to finish! When we downsized, I didn't know what to do with the nightstands and small dresser that I loved. I bought them second hand years ago because I liked the design, but they were shabby when I bought them and it only got worse after years of use. An internet search turned up The Restoration Studio, and I couldn't be happier with the results. 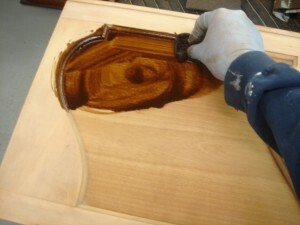 The lacquer finish must be difficult to do, but it turned out perfectly, and the pieces look like new. Jennifer picked them up at our old house and delivered to our new apartment. I love the feeling of recycling something that still has years of useful life. Better than buying new! 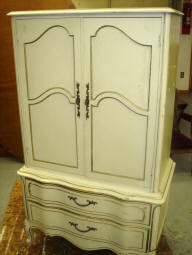 Vicki Hughes, New Jersey I have an almost 30 year old Thomasville pedestal table and chairs made of oak. I still loved the country french design, but while the table was still very sturdy, it was worn and dated looking, with a faded, yellowed pickled oak finish. 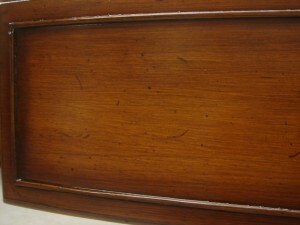 I had an idea to stain the table top and chairs a dark espresso, and do a whitewash on the pedestal. They totally got it and the table looks amazing. It really looks like new, and the finish now has an updated, refreshed modern farmhouse look. It's gorgeous! My husband and I both absolutely love the results. They also picked up and delivered my table and chairs and had them back to me by Thanksgiving, which I had hoped for. I was a little worried going in, but my fears were needless. This is a winner. 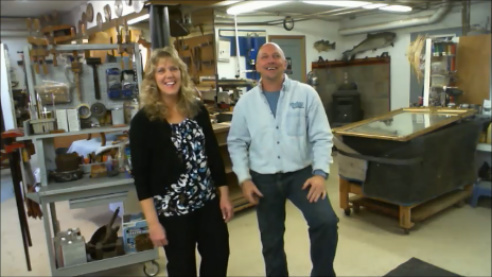 The Restoration Studio is a small family run business owned and operated by Rodney and Jennifer Keyser. 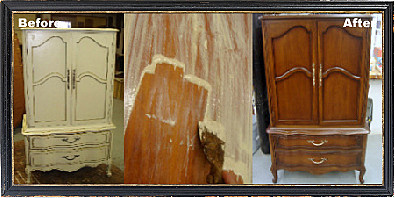 We first opened in 1990, and we have been refinishing and restoring furniture all over southeast Pa and New Jersey full time ever since. It has always been, and will always be, about quality. 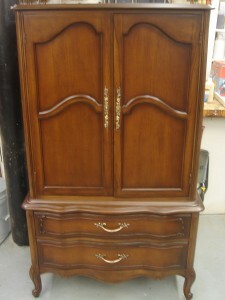 We’re passionate about furniture, about restoring the past, and about exceeding our clients expectations. 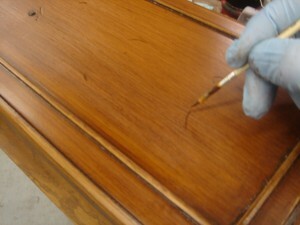 To say The Restoration Studio strives to be the very best at what we do is very true. That’s the essence of who we are – but it hardly tells the whole story .. 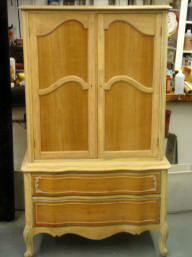 It's not unusual for us to restore a family heirloom for a client. Not just a piece of furniture, but a piece of family history. Sentimental attachment to an item can be a powerful emotion. The reaction we get on delivery is what makes our job so amazing. We have been hugged, kissed, and yes, we have even seen grown men cry. We are constantly pushing the boundaries within our trade. While many choose to lower quality in order to lower their prices, we choose to be the defiant troublemakers within our industry, raising quality and elevating our standards. Keeping our overhead low has allowed us to keep our quality high. We love what we do and that passion and commitment is reflected through in the work that we do. We work with both residential and commercial clients and no other company in our local industry has a larger service area than The Restoration Studio. Enjoy our website, it's the largest and most comprehensive website in the industry. If we are what you are looking for, click on the GET A QUOTE tab and we will assist you in getting your project underway with a free online estimate. but each experience is unique. See our most recent projects and what we're up to by visiting our Facebook page! Visiting our work studio is by appointment only. Since we are a working shop, we kindly request that jobs inquiries begin by filling out Our online quote and submitting pictures. We will review your request promptly and respond via email. 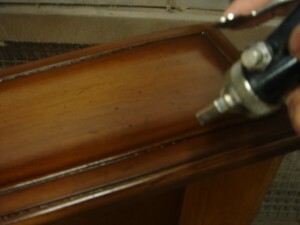 Check out all our DIY furniture restoration videos on our YouTube channel !